'Day Glow' (Keith Keppel, R. 1996). Seedling 89-110A. TB, height 36" (91 cm), Early to midseason bloom. 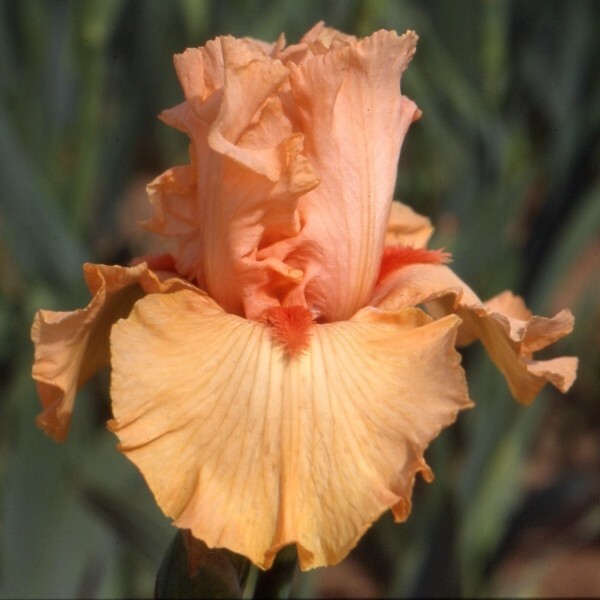 Standards pinkish apricot (M&P 9-F-6 to 9-D-7); style arms slightly deeper (9-G-7); falls pinkish apricot (9-I-6 to 9-F-5); beards tigerlily (1-F-11) to fire red (1-F-12); slight fragrance. Seedling 79-57B: (seedling 75-38A: (((('Frances Kent' x 'Mary Randall') x seedling 60-183Q: (Sexton seedling 60: ('Gail' x 'Techny Chimes') x 'Golden Gene')) x ('Denver Mint' x seedling 60-183-O)) x ('Radiant Light' x ((('Golden Gleam' x 'Hallmark') x Sexton seedling 60) x seedling 60-183A)) x 'Orange Fire') x 'Orangerie') X 'Champagne Wishes'. Keppel 1997. From AIS Bulletin #305 April 1997 Introducing DAY GLOW (Keppel) TB, EM 36" (((sdlg. x Orange Fire) x Orangerie) X Champagne Wishes) Starchy pinkish apricot with fiery beards. #89-110A. $35.00. Keith Keppel.